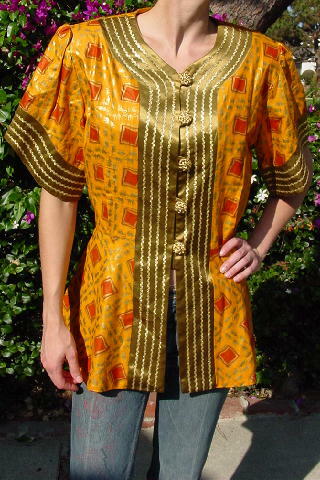 This 100% cotton blouse has a pumpkin color background and was made in the USA. It has a pattern of freeform line boxes and elephants. The elephants are in golden bronze and the boxes are in rust and golden bronze. The sleeves (curved ends) and both sides of the front have golden bronze polished cotton accent panels with four rows of metallic gold-tone rick-rack trim. 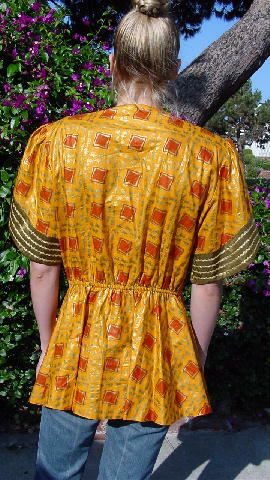 It has a scoop neckline and 5 elevated gold-tone textured flower buttons. The bottom 11 1/4" is open. It has fabric matching shoulder pads, gathering at the shoulder-sleeve seams, an elastic back waistband, and a full back bottom section. It can also be worn as a jacket. It's from a former South African model. shoulder to end of sleeve 9 7/8"